Dr. Tracy has always dreamed of becoming a veterinarian. After working in the music business for 6 years her dream came true in May of 2000 when she graduated Louisiana State University School of Veterinary Medicine. She can honestly say it is the BEST CAREER EVER! 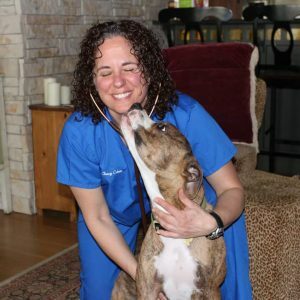 Her professional interests lie in canine behavior, internal medicine, nutrition, and personalized, prevention plans. She takes pleasure in creating strong human-animal bonds and helping clients maintain their pet’s health through all their life-stages. She is an advocate for the homeless, and loves to see a newly adopted animal for their first examination. When Dr. Tracy is not working, she enjoys knitting, crocheting and designing clothing. She also loves 'crushing it' at her favorite athletic facility. She shares her home with her husband, 2 daughters and 2 rescued shelter dogs.